Beyerdynamic Amiron Wireless review | What Hi-Fi? You would be forgiven for thinking, when seeing what these headphones are called, that these Amiron Wireless cans are simply the wireless version of the five-star, Award-winning Beyerdynamic Amirons. You’ll have gathered, though, from the star rating, that things are nowhere near that simple. This is a really frustrating pair of headphones. They have the potential to be very good examples of the breed, but there is one flaw in their makeup in particular that drags everything back into the realms of the disappointing. The Amiron Wirelesses differ from their almost namesakes in a few areas, some obvious, others less so. First off is the lack of a cable connecting your headphones to your source – unless you need to use one, of course. If you run out of power, the option to tether yourself to your source is a useful one, and a cable with a three-button remote is supplied with the headphones, along with a charging cable and a semi-hard case. That lack of a fixed wire does mean that there are instead two short cables running from each earcup to the headband, but it isn’t to any great detriment of the looks of this nicely built pair of headphones. The Amiron Wirelesses are well made from aluminium and high-quality plastics, with a plush-feeling Alcantara headband. As you would expect of a product at this level, this feels suitably premium in build and feel. The other major difference between the wired Amiron and the Wireless is that the £550 Amiron is an open-backed model, where these Wireless headphones have a closed-back design. There are advantages to both these build options, the most obvious discernible difference between the two styles (to others, at any rate) is that a closed-backed headphone will leak a whole lot less noise than its open-backed cousins. On the subject of noise, there is no noise-cancelling technology on these headphones. That closed-in design also means that the Amiron Wireless has a rather neat party trick: the back of the right-hand earcup is touch-sensitive and doubles up as the headphones’ control mechanism. So a tap or a swipe, or combinations of the two, will control things such as volume, fast-forward and rewind, skip track, answer call, or access to your mobile assistant. As with most relatively new bits of tech, this control method takes a bit of getting used to, but once we’ve given it a good run and practised for a while, we find things start to become as simple as pushing a button. Of course, it does mean that the headphones have much cleaner lines, without any visible means of control. All you have on the earcups, as far as buttons and inputs go, is the USB-C input for charging the headset (Beyerdynamic claims that the Amiron Wireless will keep going strong for at least 30 hours on a full charge), the 3.5mm headphone socket, a microphone (betrayed by a small hole in the casework) for calls and talking to your digital assistant, and a long push-button to turn the headphones on and off, and to initiate the Bluetooth set-up. We find this switch a little grating to use. It’s set flush to the casework of the headphones, and as such it’s sometimes difficult to know if we’re actually applying enough pressure or not. It’s a small thing – and the button lights up after a second or two to acknowledge the input – but we find it irritating, nevertheless. Normally, with a wireless pair of headphones, we would expect to be using them a fair amount out and about. The Amiron Wireless costs the thick end of £700, however, so we can imagine quite a few people being somewhat reticent to use them on the train or bus. 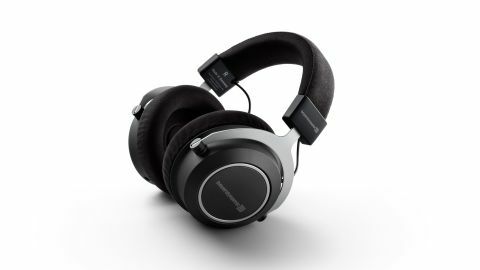 Indeed, a glance on Beyerdynamic’s website shows that the German company is pushing these as headphones to use in the home rather than out on the street. We charge up the headphones and connect to our MacBook Pro laptop via Bluetooth without any difficulty. It seems the Amiron Wirelesses sit comfortably on our head – there’s no excessive pressure on the ears from the clamping force, and the headset feels reasonably light to wear. We can imagine wearing these for lengthy listening sessions without too many problems – and glasses wearers can rest easy. We play Sucker Punch by Sigrid on Tidal HiFi and are pleased with the treble and midrange being relayed. Voices come across clean and crisp, and the sound is punchy and rhythmic. We are puzzled, however, at a feeling that the bass is lacking somewhat. We try a pair of Award-winning Sony WH-1000XM3s (half the price of the Amiron Wirelesses) to compare, and the bass pulsing through the track is immediately apparent. So what is amiss with the Beyerdynamics? It seems it’s an issue of basic fit. When we push the padded earcups tighter onto our ears, the bass kicks in nicely – it is fast, taut and generally what you’d expect from a pair of premium hi-fi headphones. Release that bit of pressure, however, and the music is transformed back into something completely biased to the upper registers, and any track played loses its impact as a cohesive whole. Other members of the What Hi-Fi? review team try on these headphones, and each one has the same issue: the earpads seem to sit just proud of the head underneath and behind each ear, leaving a discernible gap. Without a proper seal, any decent bass presence just isn’t an option. We try the (wired) Beyerdynamic T1 headphones to confirm our thoughts, and these fit perfectly. We are left with a pair of £700 headphones that require assistance – by pushing in both earcups just below our ears – to sound anything like their best. To say that isn’t ideal is an understatement. And it’s a shame, because with manual assistance, the Beyerdynamic Amiron Wirelesses sound really quite impressive. Get the bass right and the music as a whole becomes far more coherent and enjoyable, and we can begin to see the point of investing this amount of money. Clearly, though, we don’t wish to wander around all the time with our hands clamped to our cans – and when we release the earcups, all the life disappears and the sound is decidedly below par. The Amiron Wirelesses have the potential to be decent wireless headphones. Whether they merit that pricepoint without the benefit of active-noise cancelling is up for debate. What is unquestionable, however, is that we cannot recommend them with the issues of fit and bass leakage that they present us at the moment. And that makes them a huge disappointment.